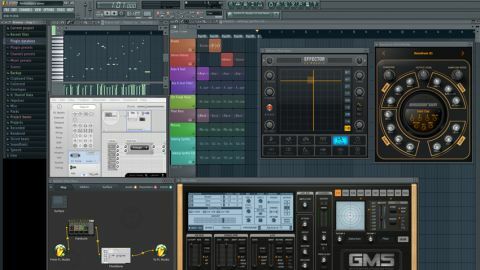 FL Studio continues to age gracefully, still with its own identity but adding features that bring it into line with current music making paradigms. FL Studio still has a unique look and feel. Right-clicking a parameter now enables you to input a value manually. The latest full version of FL studio is here, bringing a range of new features including a Performance mode, multitouch support, new synths and new effects. So, how do they stack up, and how big a leap is it for the Windows software that's regularly voted one of the best DAWs in the world by MusicRadar users? Performance mode enables you to trigger Playlist Clips live using a mouse, touchscreen, QWERTY keyboard or MIDI controller. Multitouch support is a welcome addition to Performance mode - assuming you're using a Windows 8 laptop or other touchscreen monitor, that is - particularly when you want to combine clips on the fly. Being able to touch the screen gives a more hands-on approach to performance, especially in terms of triggering combinations of loops and automation. For example, you could use four fingers to introduce a new drum loop, chord sequence, filter automation and lead melody at the same time without having to set your choices in stone before the performance. Extended controller support will also benefit a lot of FL-based performers. It is now much faster to get going with a Launchpad, Maschine or other supported hardware. Performance Mode works well and has FL's customisably colourful visual flair, along with a handy clock-style 'fill' of the Track name as the clips you've pressed play through. It is a joy to perform a song with, but the required variation of loops and automation in just one track means that making a whole DJ set-length performance in this way would be a challenge. Although the system works well, it would be difficult to sustain the workflow over a full set. Hangovers from a clunkier era remain, such as having to prepare a project for Performance Mode by going through Tools > Macros > Prepare for Performance mode. FL is becoming more intuitive, and having to do things in such a way contrasts with the slicker approach it's aiming for in other areas. Patcher, FL's effect chain construction tool, has had an impressive overhaul. It is uncluttered and stylish, and even though you might not use it on every mixer bus, it is useful for complex chains that you want to be able to recall and adapt easily. Groove Machine Synth is a new hybrid wavetable Synth plugin adapted from the existing Groove Machine, and is an impressive inclusion. It's standard fare in the synth section, but there's also an inspiring effects section in which every selectable effect has an X/Y pad you can instantly modulate. Its main weakness? It seems a bit superfluous when you get to the performance-based Effector, a fabulous plugin with a variety of quality effects and an intuitive interface, evidently designed with touch input in mind. The selectable effect types look like virtual pads, and the XY pad has a large surface area that makes it ideal for poking and swiping. Stand-out effects include a metallic-sounding flanger, the stereo effect that enables you to sweep across the stereo field and a bitcrusher for making things momentarily lo-fi. The kick-synthesizing Bassdrum is another excellent new tool, easily producing deep, modern kicks. Less headline-grabbing tweaks in version 11 may prove the most exciting to those using FL for composition and production on a daily basis. Notes on the piano roll can now be locked vertically or horizontally while moving them. You can also play truncated notes, meaning that if you cut a section out of a clip on the playlist, notes that would no longer trigger due to their start position having been trimmed can trigger from wherever they newly begin. Another addition is the ability to right-click on FL's plugins knobs/sliders to type the specific value for the parameter, or link them directly to a controller. The only drawback is that you might come to expect it of third-party plugins. Version 11 is not an unrecognisable evolution, but the additions and tweaks are welcome. On the whole, even in the areas where gripes still exist, you get the feeling that there are greater things to come. Where no such gripes exist, FL is a joy to write tracks with, and is now finding its feet as a performance platform. FL Studio 11 improves an already phenomenal DAW package, even if it's by welcome increments rather than any grand leaps.